Can we redefine ownership to adapt it to the current needs of society? Can that redefinition provide new opportunities for our built environment? Those were the questions about ownership that we asked ourselves when approaching this issue. All aspects of our life are more connected than ever, physically and virtually. We access and receive information anywhere anytime. We travel more often and farther. We change what we consume and the way we consume it. The personal and professional aspects of our life create a network that, as time goes by, incorporates more and more layers of complexity. This complexity and overlapping is not unfamiliar to the physical world. Funding, usage, management, rules and rights in public and private, collective and individual spaces, are each time more difficult to determine clearly. Both in the virtual and physical world, the formerly defined relationship between buyer and seller has turned into one in which both become users and both remain active players after the transaction. Surprisingly, in most cases, these new scenarios of blurred boundaries are met with the exact same rules that have been used for decades and centuries and are incapable of successfully addressing the current conditions. This disconnection suggests two options: Can we redefine ownership itself to address the changes? Or, if the answer is negative, what can we do as designers to find the gaps to provide new opportunities? 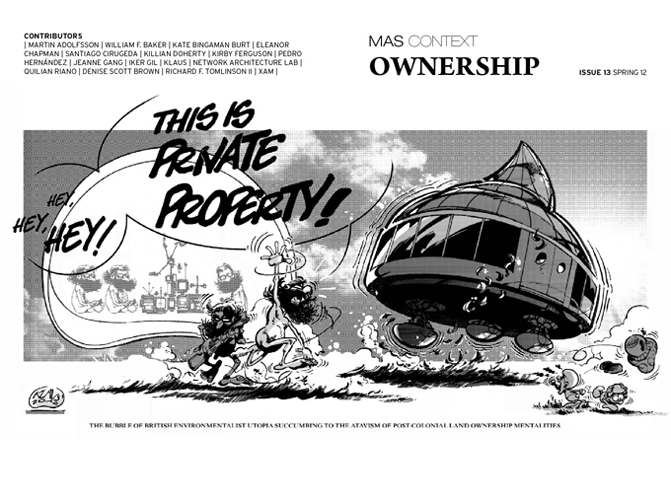 This issue explores the concept of ownership in two main areas: intellectual and cultural ownership, and legal and physical ownership. The thirteen contributions featured in this issue deal with aspects of tradition, identity, creativity, copyright, occupation, privatization, excess, reconfiguration, legality and consumption. They range from urban analysis, architectural proposals, strategic interventions and personal documentation, to discussions and illustration of the role of ownership in intellectual property and in fostering creativity. They address and provide a possible approach to ownership when they are not redefining the concept in itself. Ownership is a determining factor in the way we live and understand our society. For that reason, it’s a great moment to look into what it means with optimism and a fresh point of view, understanding its origins, the challenges that we face now, and the opportunities that it can offer for the future. The contributions by Denise Scott Brown, Martin Adolfsson, Kirby Ferguson, Network Architecture Lab, Eleonor Chapman, Quilian Riano, Killian Doherty, Pedro Hernández, Jeanne Gang, Santiago Cirugeda, XAM, Bill Baker and Richard Tomlinson, and Kate Bingaman Burt provide an excellent foundation on which to continue the discussion about ownership.